Oooooo…do we ever have a fun challenge for you this time on the SUO Challenge! The theme is FUN FLORALS and who doesn’t love all thing flowers! I decided to pull out my Petite Petals stamp set…haven’t used that for a while and thought it would be a fun little set of flower for my card! Whisper White – 3 1/2 x 5 1/2. The left side is 3 1/2 and the right side is 2 1/2. Add to card front leaving a little bit of the black showing through at the top. 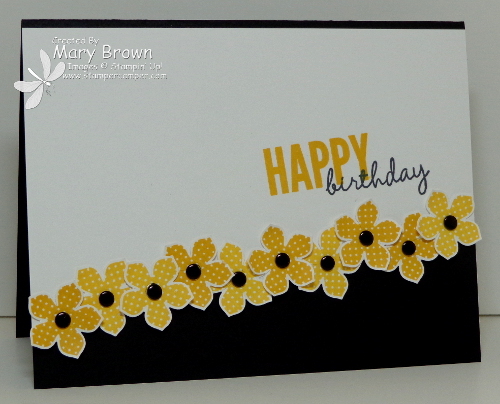 Stamp HAPPY in Crushed Curry and Birthday in Memento Black. Add black candy dots (or color any color candy dot with Black Sharpie if you need more) to the center of the flowers to finish off. This entry was posted in Spring Mini, SUO Challenge and tagged Celebrate Today, Petite Petals. Bookmark the permalink. What a lovely bright and sunny looking card. Colors are super together. LOVE the yellow and black together. Very pretty card! sooooooooooo pretty. i would like to case this!